Citizens of The Nation are waiting for answers from the Ford government after it was discovered — by accident — that the Ontario Energy Board awarded a 20-year licence to generate electricity to the Eastern Fields wind power project. Eastern Fields was on the list of 758 power projects cancelled by the Ford government last July, and a check with the Independent Electricity System Operator (IESO) shows that the power developer, U.K.-based RES Canada does not now have a contract. Save The Nation put out the following news release, and is waiting for answers from the Ontario Minister of Energy, Greg Rickford. In the meantime, says Wind Concerns Ontario president Jane Wilson, the citizens of The Nation lost seven valuable months in which they could have been gathering data on environmental impacts from the wind turbines. Wind Concerns Ontario has government records of thousands of reports about excessive wind turbine noise, which have not been resolved. With more wind power projects queued up for environmental approvals to produce intermittent electrical power Ontario doesn’t need, Ontario’s new Minister of the Environment and Climate Change needs a fresh approach. The previous Minister left thousands of complaints about noise and vibration unresolved, and did not follow through on promises to help people affected by the huge wind turbine installations. Right now, in the Ottawa area, two projects are planned: the “Eastern Fields” in The Nation and “Nation Rise” in North Stormont. Both are opposed by their communities, both projects will come with negative environmental and social impacts, and neither will produce power that’s needed. Wind Concerns Ontario has sent a letter to the new Minister with a “To Do” list for his immediate attention. REA Approval Process – Increase setbacks from residences to reflect learning from MOECC complaint records that include staff reports that confirm that current regulations are not sufficient to protect health of residents living in wind projects. Last week, the Supreme Court of Canada set out standards for consultations with communities which are substantially more rigorous than the standards used for Ontario Renewable Energy Projects. Health Studies – The Ministry has been telling residents that its policy is based on the “best science” available since the first turbine projects were built. MOECC records clearly show that this is not correct, but the Ministry continues to be willfully blind to input from both residents and its own staff, quoting dated and selective literature reviews in a field where the science is rapidly evolving. The need for noise studies and other investigation has been highlighted in numerous reports but never undertaken. It is time for some serious field studies of the problems being caused by wind turbine projects in rural communities across Ontario. This was an information gap identified in 2010 by Ontario’s Chief Medical Officer of Health. Last, it is important that as you prepare for this major portfolio, you understand that industrial-scale wind power generation does NOT benefit the environment. The Independent Electricity System Operator (IESO) last week announced contracts for five wind power projects, for a total of 300 megawatts of new wind power generation. According to Ontario’s Auditor General, the province is already in a situation of a surplus of power, and selling off the extra at a loss, a good portion of which is due to wind power. Two Ottawa area communities were named in the contract announcement. The Municipality of Nation and Township of Champlain were tipped for a 32-megawatt project by RES Canada, and North Stormont is to get a 100-megawatt project by EDP Renewables. EDP Renewables (head office Spain) operates the South Branch wind power project in Brinston, which it purchased from Germany-based Prowind. Citizens of Nation/Champlain who want to get involved should contact Save The Nation/Sauvons La Nation here. In a recent paper prepared by eight Ontario academics (Fast et al, Nature Energy, January 2016), Ontario’s procurement process for large-scale renewable power projects came under fire for ignoring community concerns. News reports following last week’s contract announcement quote local mayors as saying they feel “betrayed” by the government action–Dutton-Dunwich mayor Cameron McWilliam was quoted as saying “We live in the Province of Toronto, not the Province of Ontario.” His municipality conducted a full, legal referendum which resulted in 84% saying NO to the wind power project–they are getting a 57-megawatt project by U.S.-based Invenergy. The municipalities do not even know where the turbines for the proposed power projects will go, as that information is not part of the bid process. St. Isidore–With a September 1 deadline to apply to the Ontario government for a share of the provincial allotted windpower megawatts (MW), four wind companies held public information open houses in three eastern Ontario counties, detailing their area proposed projects. Two of these were: the RES Canada presentation in Vankleek Hill for the 15-turbine, 40 MW Gauthier project on June 22, and the EDF EN Canada presentation for the 14-MW project in St. Isidore on June 23. With EDF having a large number of solar and wind proects in 19 countries throughout the world, including scattered throughout the United States plus Alberta and Quebec, the company is looking to expand its presence in Ontario, says David Thornton, from stakeholder relations at the company. Thornton started as a staffer in Premier McGuinty’s office, was the former campaign manager for the Ontario LIberal Party, and over six years at Queen’s Park, was senior policy advisor for renewable energy at the Ministry of Energy, and also senior policy advisor for land use planning and municipal affairs at Municipal Affairs. Thornton and his staff fielded questions from the audience. “Who do you work for?” Thornton asked Sylvia [sic] Gagnon. “I work for no one,” Gagnon replied. 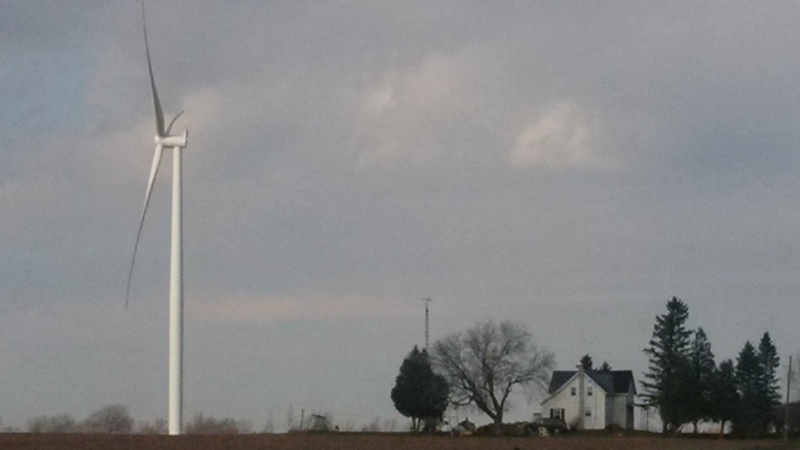 “I live in North Glengarry and I’m against the invasion of our beautiful farmland by these monstrosities. However, “all these farmers who sign up will be paid something, whether they get a windmill or not,” added Mark Gallagher from EDF. EDF pays the municipal taxes on the windmills, said Gallagher *** which would come to $150,000 per year on a project smaller than what they are proposing in St. Isidore. The one farmer who held out from EDF, having 700 acres in the St. Isidore area as part of his 5,000 acres in two counties, gave a quick walk through scanning the posters and [said] “I’ve seen enough, I’m going home,” he told Ontario Farmer. He said his instincts are telling him “this is going to end badly. The night before, in Vankleek Hill, the RES Canada presentation had fewer posters but the issues and the concerns for those attending were exactly the same. “I have no idea where the Liberal government is getting the money for these things,” said local mayor [Champlain] Gary Barton at the RES presentation. Barton, unlike his counterpart in St. Isidore is not embracing the proposed project in his area. However, under the Green Energy Act, “there is nothing I can legally do,” said Barton. He recalled a specific face-to-face meeting several years ago [that] involved him and another local mayor with then Ontario Energy minister George Smitherman, expressing concerns about a large solar project in their area. “He told us there is nothing you can do,” said Barton. Electrical engineer Stan Thayer was at the RES presentation noting, “I’m not against anything. When I was at McGill in the 1970s we worked with solar panels and wind mills. I understand all this. “But, I can’t afford it,” said Thayer. “Plus, the BS being presented to the public is wrong,” he said. 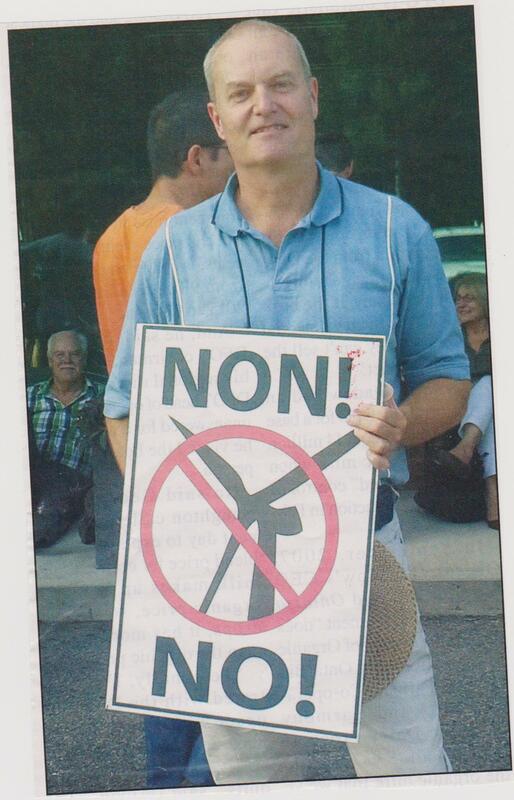 “No one has shown me facts from any windmill, no matter the size, making a profit,” said Thayer. * It’s the way they work now: the new procurement process requires sign-off from adjacent landowners so developers are paying people. ** $1,000 a year for noise, vibration and changed property value? *** Taxes on wind turbines (they are NOT “windmills”) are capped under the Green Energy Act at $40,000 per megawatt, in spite of the fact the turbines cost $2-3 million. The property tax revenue is less than 20 or so houses. **** The wind developers get to choose where the money from their “vibrancy” or community funds go, and they like to choose sports so they can have their name plastered all over it as advertising. Recent news reports tell us that many residents of downtown Ottawa are disturbed by the prospect of a 42-storey condo tower in the Preston Street area. “Not in keeping” with the neighbourhood, they claim, and the condo tower would be the tallest building in Ottawa. Not if the wind power project goes ahead. The wind turbines specified by Prowind Canada (a subsidiary of Germany-based Prowind GmBH) are 190 meters or 626 feet tall. As power generating machines, they do make noise and produce vibration (infrasound), and they will be lit at night by aviation safety lights. The photos on Prowind’s website depicting the impact of the turbines on the North Gower-Richmond area are misleading and duplicitous. As we have said before, the real view of the turbines from Malakoff Road would not be of some misty distant towers—you would not even be able to SEE the nacelle from that view. We offer this information at the risk of having the wind power developer claim our objections are based on a dislike for the “look of them” and in the hope that by noting the true size of these machines, people–especially our city-dwelling friends and fellow citizens–will come to understand what is really happening when a wind power project is proposed: it is the invasion of a quiet community by a huge industrial project.